Arslan Senki is an anime that has just started airing in the Spring 2015 season. It is on its second episode and can be watched on Funimation. The first episode was not terrible by any means, but it really didn't stand out to me. The second episode however, was a huge step up from the first, and accordingly, is now one of my favourite prospects of the season. To give you some perspective on Arslan Senki, it's relatable to an anime called Yona of the Dawn, which just finished airing. In that show, we are given a helplessly dependant princess whose world is immediately flipped upside down. As a result, she grows into a warrior and leader worthy of accolades. Arslan's character is building in a similar fashion. Alongside Yona of the Dawn, this show is similar to Lord Marksman and Vanadis, an anime from Fall 2014. 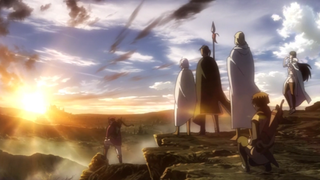 The two anime showcase battles between armies whose populations range in the hundreds of thousands, and the struggles that happen within and around the fight. If you watched and liked either of these two anime, or these aspects piqued your interest, Arslan Senki may be for you. Arslan Senki's first episode was rather dull and questionable in my eyes. It left me with a mixed bag of impressions, but for the most part, nothing stood out to me. This was just another story of a worthless prince and his overbearing superiors. The show displayed scenes that only served to prove that our protagonist, Arslan, was pretty worthless. Being only eleven in at this time, Arslan clearly had much to learn and nothing to show for himself. At this point, it was clear to me that if the show continued to portray "the daily life of a silly young prince," as its story, I was out. This all changed when the second episode came. First episodes are normally the foundation of a series; they give you a glimpse into what you should expect from the remainder of the show, however Arslan Senki's second episode proves that it doesn't follow this normality. The second episode immediately jumps three years into the future, and by doing so, it eliminated my previously stated fears. It's not like Arslan is now reformed and all knowing, but certain events happen in this episode result in a grand setup to mature the prince and shape his life in such a manner. As the title of the show states, this is the heroic legend of Arslan; the first two episodes are simply single steps of this adventure, an adventure that may span his whole life. Going back to the first episode, though it lacks general appeal, it is entirely necessary. When the show is finished we will be able to look back at how it started and compare the two Arslans. It will be more than satisfying knowing that our protagonist's origin was so pitiful in comparison to this future. Character development is a key component of a great story, and I believe Arslan's will be more than satisfactory in the long run. We all know what his end point will be; this is merely the tail of how Arslan will get there.